Jaguars learning and winning on the job based on the simple concept of competition. Century wrestling has become accustomed to winning. And this year is no different. But before you can walk, you have to crawl, and while the Jaguars are winning on the mat, head coach Guy Takahashi said this year's young team is learning how to do so off of it as well — slowly but surely. "We've been improving," said Takahashi. "We have a very young, sophomore-dominated team with just a few seniors in the lineup right now. But due to what we have, our start has been a lot slower paced, and due to that inexperience, we've had to work on getting up to our pace." 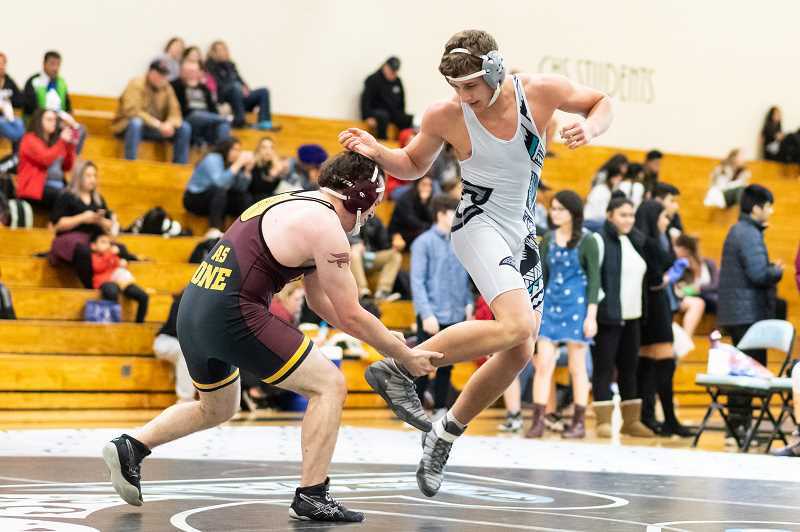 The Jaguars are undefeated in league duals to this point, including lopsided wins over Glencoe, and recently back-to-back wins over Forest Grove and McMinnville Thursday, Jan. 10, at Century High School. In addition, they've impressed with a seventh-place finish amongst 30 teams at the highly competitive North Bend Coast Classic, winning the Larry Owings Invitational, and placing fifth at the 51st Garner Ivey Maui Invitational last month in Hawaii. Individually, Century is led by senior Loudyn Reese, who won the 195-pound weight division at both the Owings and Garner Ivey meets while placing second at North Bend; Loudyn's younger brother Brody, who won the 285-pound division in the Owings, North Bend and Maui events; and Ernesto Alvarez, Uriel Rodriguez and Sean Cabanban, all of whom own invitational victories thus far this season. However, Takahashi said as a result of their overall youth, having just three seniors in the regular lineup, the team started slow. But since the holiday break, the Jaguars have been progressing nicely, and the coach is confident they'll get where they want to be come postseason. "Through the break and up 'til now, we're a different team, and we're getting better," the coach said. "We'll get there, and back to where we think we should be." One of the initial and biggest hurdles Takahashi said he encounters with young teams like this season's is the lack of understanding of one of the simplest concepts: how to compete. The coach emphasizes it as a pivotal aspect of the process of winning, and he impresses it upon his wrestlers on a daily basis. "If we learn to compete, the rest will fall into place," Takahashi said. "On the mat, in school, in life — if you're competing, good things will happen. Wins and losses don't matter. It's about the process." Century has reached the midpoint of this season, and won all four of its duals against Beaverton, Lakeridge, North Salem and St. Helens at Forest Grove's Bob Beisell Invitational on Saturday, Jan. 12. The Jags will continue to work over the next handful of weeks in an effort to peak for the district and state championship next month. But while the coach and team will continue to work on fitness, strength, and technique in the gym, it really all comes down to two pretty basic ideas. "Compete and get better," Takahashi said.